So today my tutorial professor Mildred Howard took us to visit Magnolia Editions in Oakland. She really goes above and beyond. What an incredible space! There were notable artworks both carefully displayed in the lobby and scattered, hung, tucked and neatly filed all over the place. Don Farnsworth gave us a tour and struck me as just the sort of person who would get along nicely with the various engineer, rocket scientist, neuroscientist, etc. set of my friends who build crazy things in their spare time. The thing that clenched that impression (besides his knowledge of the human-eye/brain, color, etc.) was the studio-made coffee roaster. 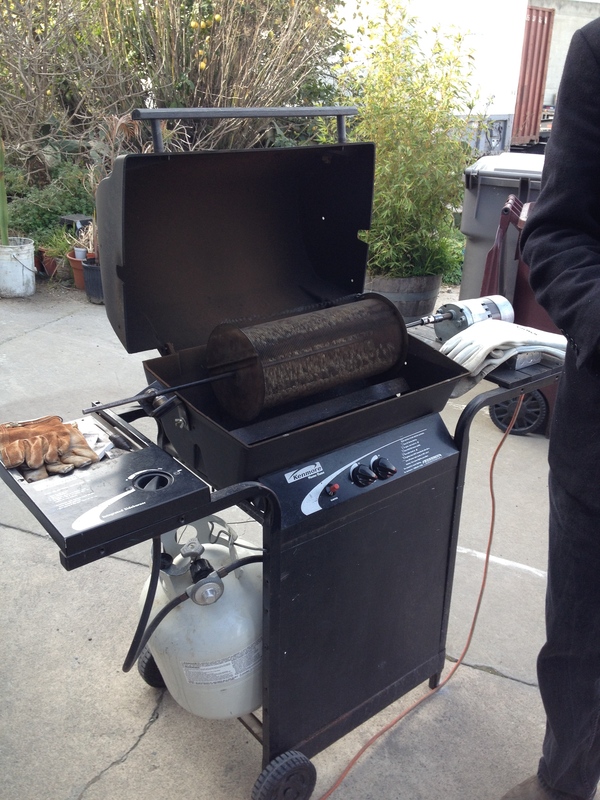 It’s a re-purposed barbeque with a little motor for a rotator to turn the little cage for the beans. We roasted them while he talked about the fine art of coffee-roasting, cooled them over an inverted house fan over a screen, and then he stamped and filled bags for us. Things like this reassure me about the art world. I’m glad I’m not the only geek here. Magnolia has all kinds of incredible toys I want to play with- a huge laser etcher/cutter that has eye-beam spotting (senses dots on your material to better line things up). They have a print shop, paper making studio, a large scale watercolor printer… so many things. Especially interesting to me is that they also have everything (including the knowledge and skills) for designing large scale digitally designed tapestries like the Pae White piece that blew my mind at the art fair in LA (a smaller version of this). It turned out the Magnolia folks did it with her and everything is printed on the largest loom of this kind in Belgium. Something about soft flexible, untreated fabric looking like metal just does it for me. That it’s in the weave, not any application on the surface. Anyway- a HUGE printer (more than half the size of my living room huge) that prints on a wide variety of surfaces. While we were there they printed a new piece that will be used for Imagery Winery’s new label (it is an award-winning winery which commissions artists to do their wine labels. The surface of the piece itself was layers of laser-etching, then building up the surface and finally printing over the relief. Wonderful stuff. The whole atmosphere was really a delight. I would love to come back there with a project to do with them and their lovely toys. On a side note they were doing exactly what I was doing all day yesterday- using the laser cutter as part of the printmaking process. Something that seemed like a natural move to me, one I was not at all surprised to hear that others have already been doing.